Aims: Regarding the low level of physical activity (PA) in schizophrenia and bipolar disorder (BD), our aim was to compare the level of PA between the two groups. 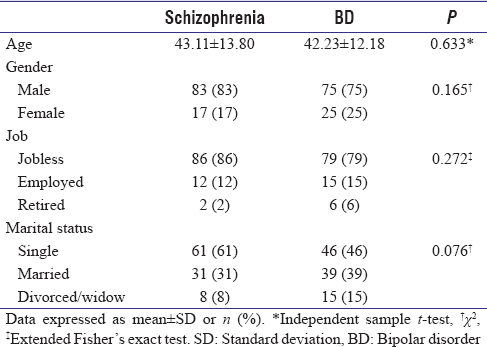 Methods: In this cross-sectional study, 100 patients with schizophrenia and 100 patients with BD were selected through convenience sampling in 2017. The level of PA was assessed using International Physical Activity Questionnaire. Chi-square, extended Fisher's exact, Student's t, and Mann–Whitney tests were applied to analyze the data. Results: Prevalence of low PA in schizophrenic patients and BD was 36.7% and 30.3%, respectively. The frequency of moderate PA was less in schizophrenic patients than that in the BD patients (56.1% and 65.7%, respectively) and vigorous PA was more frequent in schizophrenic patients than the BD individuals (7.1% and 4%, respectively) (P = 0.334). Schizophrenic patients had significantly fewer minutes of PA than that of the BD patients (P = 0.027). Minutes of vigorous PA were higher in schizophrenic patients, while BD patients had more minutes of moderate PA, but these differences were not statistically significant (P > 0.05). BD patients had significantly more walking minutes than that of the schizophrenic patients (P = 0.05). Conclusion: The prevalence of inactivity was higher in schizophrenic patients than BD patients. This rate was high in both groups due to hospitalization, factors associated with the disease, or even lack of attention to these patients. Therefore, more attention should be paid to the physical health of these patients; also, psychiatric centers should take preventive and interventional measures in this regard. (PA is the physical movement generated by the musculoskeletal system that needs energy expenditure and includes activities undertaken while working, playing, carrying out household chores, traveling, and engaging in recreational pursuit activities. Several studies indicated that PA reduces the risk of many chronic diseases and thus increases the life expectancy., Epidemiological and clinical studies as well as the guidelines presented in the United States, England, Australia, and the World Health Organization have shown that at least 150 min of moderate activity, 75 min of intensive activity, or a combination of moderate and intensive activities, so that 2 min of moderate activity equals to 1 min of intensive activity, have significant health benefits. Across the world, 31.1% of the adults (95% confidence interval [CI]: 30.9–31.2) are physically sedentary; from 17% (CI 95%: 16.8–71.2) in the South East Asia to about 43% in America and Mediterranean East. High prevalence of physical inactivity in people with schizophrenia and BD has also been reported in many studies., In a case–control study in Portugal, the prevalence of sedentariness in patients with schizophrenia and members of the control group was 64.2% and 50.1%, respectively. Regular PA is crucial in improving the physical and mental health of people with schizophrenia and BD. By determining the level of PA and presenting the prevalence of low PA, findings of the present study can later be used as a roadmap to pay more attention and plan for the improvement of these patients' health. Furthermore, little information is available about the PA status of these patients in our country. Hence, the objective of the study was to investigate and compare the level of PA in patients with schizophrenia and BD. This comparative cross sectional study was conducted in 2017 at a psychiatric center and Fatemeh Al-Zahra charity institute in Yazd Province, Iran. The statistical population comprised all patients with schizophrenia and BD in Yazd province. A total of 100 patients with schizophrenia and 100 patients with BD were selected through convenience sampling. Inclusion criterion was having a diagnosis of schizophrenia or BD. Patients were identified based on the clinical interviews by a psychiatrist and according to the Diagnostic and Statistical Manual of Mental Disorders diagnostic criteria DSM-IV-TR. All participants were hospitalized in the acute or chronic phase of the disease and were under medical treatment. Exclusion criteria were comorbidities with other psychiatric disorders, age <15 years and >69 years, pregnancy, and immobilization conditions due to disability of the patient. This study was approved by the Ethics Committee of Shahid Sadoughi University of Medical Sciences in Yazd. The closest people to the patients were also asked to fill the informed consent forms before entering the study. PA was assessed using a standard International Physical Activity Questionnaire (IPAQ). This questionnaire is available in both short and long forms and considers the patient's activities in the last 7 days that took at least 10 min. IPAQ was suggested as the instrument of international measurement of PA in the age range of 15–69 years by the WHO and the Centers for Disease Control and Prevention in Geneva in 1998. Its validity and reliability had been endorsed by many studies. Content and construct validity, factor structure, internal consistency, and stability of the Iranian Version of IPAQ were measured. In the short form, three types of activities were asked about, namely walking, moderate activities, and vigorous activities. In the long-form questionnaire, the level of PA was evaluated in four modes, namely leisure-time PA, domestic and gardening activities, work-related PA, and transport-related PA. Vigorous activities are those that require a lot of body strength and cause a person to breathe much faster than the normal rate, such as lifting or carrying heavy objects, gardening, drilling, climbing the stairs, running, fast cycling, fast swimming, and playing football. Moderate activities refer to activities that need moderate body strength and cause a person to breathe a little faster than the normal condition, for example, carrying light loads, sweeping, flooring, cleaning glasses, gardening rake, medium-speed cycling, medium-speed swimming, and playing volleyball. By walking, we mean walking at work or at home, walking to or from a place, and walking as exercise or for spending the leisure time. The results of both long and short forms of the questionnaire can be reported in continuous and categorical forms (low, moderate, and high). The continuous score is in the form of metabolic equivalent (MET)-min per week, which is the MET level multiplied by the duration (in minutes) of each activity in a day multiplied by the number of days in which the activity is done per week. According to the guidelines of this questionnaire, sedentary people (low PA) are those who are not placed at least in active or very active groups. People with the minimum amount of activity (medium PA) are those having each of the following three criteria: (1) having 3 days or more of vigorous activity for at least 20 min per day; (2) having 5 days or more of moderate activity or walking for at least 30 min per day; (3) having moderate activity, walking, or vigorous activity for 5 days or more per week that reaches to a minimum of 600 MET-min/week. Extremely active people (vigorous PA) include people meeting one of the following two conditions: (1) having vigorous activity in at least 3 days per week, which reaches to at least 1500 MET-min/week and (2) having moderate activity, walking, or vigorous activity for 7 days or more per week, reaching to a minimum of 3000 MET-min/week. Application of IPAQ in patients with schizophrenia has been confirmed as valid and reliable. The results of PA assessment in these patients achieved through this questionnaire can also be compared with that of the general population. A study conducted to assess the validity and reliability of this questionnaire in bipolar patients suggested that this questionnaire should be used with caution in estimating energy consumption of bipolar patients. In this study, both long and short forms of the questionnaire were used and the results were reported in both categorical and continuous forms. If a person was hospitalized in the last 7 days, the patient's nurse was asked to complete the questionnaire and, in the case that the patient was not in hospital for some days, a family member was required to complete the questionnaire. Data were analyzed using Statistical Package for Social Science (SPSS) version 16 software (Chicago, SPSS Inc.)and descriptive statistics (frequency distribution, mean, and standard deviation) were used to describe the data. Chi-square and extended Fisher's exact tests were further applied to compare the frequencies. Independent sample t-test and Mann–Whitney U-test were also used to compare the mean scores. The significance level for all tests was considered at P ≤ 0.05. The mean age of patients with schizophrenia was higher than that of bipolar patients, but this difference was not statistically significant (P = 0.633). In both groups, most participants were male, unemployed, and single, but none of these variables were significantly different between the two groups (P > 0.005) [Table 1]. A high prevalence of low PA was observed in both groups and this prevalence was higher in patients with schizophrenia than the bipolar individuals. The frequency of moderate PA was less in schizophrenic patients, while they had higher levels of vigorous PA than the bipolar patients. In the form of categorical level of PA, there was no statistically significant difference between the two groups of patients (P = 0.334) [Table 2]. Regarding the duration of PA, short form of the questionnaire was applied and the results showed that patients with schizophrenia had significantly fewer minutes of PA than the bipolar patients (P = 0.027). The minutes of vigorous PA in schizophrenia patients were higher than those of the bipolar patients, while moderate PA minutes were more in patients with BD. However, these differences were not statistically significant (P > 0.05). 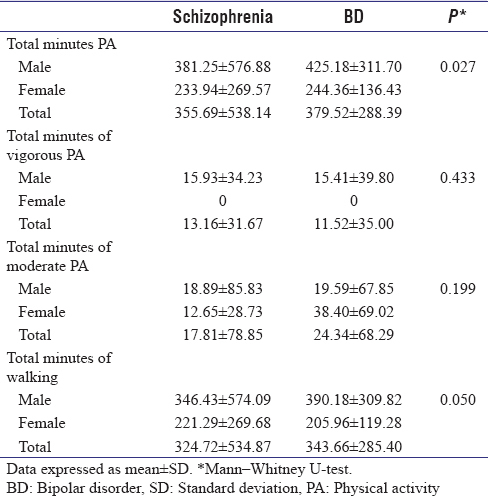 Bipolar patients had significantly more walking minutes than the schizophrenic patients (P = 0.05) [Table 3]. A review of the long form of PA questionnaire indicated higher results of MET-min/week for patients with schizophrenia in terms of total PA and work-related PA, but these differences were not statistically significant (P > 0.05). In the case of transportation, participating in leisure-time, domestic, and gardening activities, MET-min/week was significantly higher in patients with BD than individuals with schizophrenia. 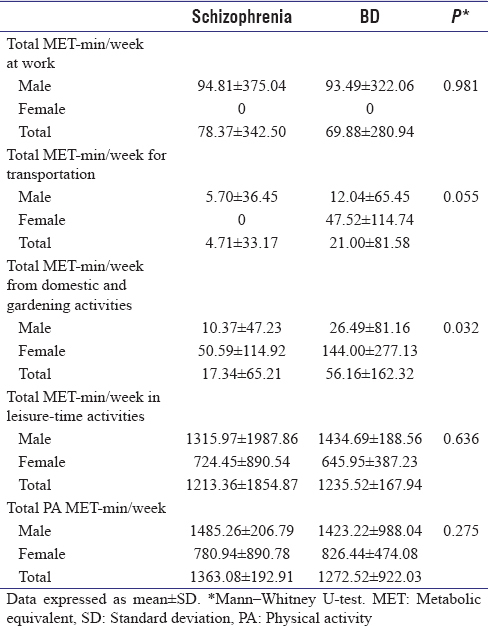 In this regard, the two groups had significant difference in their MET-min/week values for domestic and gardening activities (P = 0.032) [Table 4]. In this study, a high prevalence of low PA was observed in both patient groups. The prevalence rates for patients with schizophrenia and BD were 36.7% and 30.3%, respectively. The high prevalence of low PA in these patients may be due to symptoms of psychiatric disease such as negative symptoms in schizophrenia and hospitalization and consequently the decrease in PA. Most patients with schizophrenia and BD are prone to several hospitalizations that are usually long. In addition, consumption of sedative medicines in these individuals causes boredom, drowsiness, and unwillingness to exercise, which can justify the high prevalence of low PA in these people. The lower prevalence of inactivity in patients with BD than those with schizophrenia may be attributed to the presence of manic phases in bipolar patients. Ferriera et al. conducted a study in Portugal and reported that the prevalence of low PA in patients with schizophrenia was 64.2%. The lower prevalence of inactivity in participants of the current study than Ferreira study may be due to their better lifestyles or difference in the methods of data collection. In addition, Ferreira study was conducted on outpatients. Nonhospitalized patients usually have a higher level of PA than hospitalized patients. According to the findings of the short-form questionnaire, the total minutes of doing PA and total minutes of walking were significantly higher in bipolar patients than the group with schizophrenia. This finding can be explained by the presence of manic phases in bipolar patients. Moreover, bipolar patients have better insight into the disease and usually performed better than those with schizophrenia. In a study conducted by Vancampfort et al., in Belgium, the PA level of hospitalized and nonhospitalized schizophrenia patients was assessed using the IPAQ. The mean and standard deviation of items in the questionnaire were reported as follows: the total minutes of PA were 326.9 ± 306.7, the total minutes of vigorous PA were 36.4 ± 81.7, the total minutes of moderate PA were 110 ± 181.7, the total walking minutes were 187 ± 215.4, and the total MET-minutes/week was 1291 ± 1201.8. In comparison with the results of the above-mentioned study, our patients had more total minutes of PA, total minutes of walking, and total MET-minutes/week, but their total minutes of vigorous and moderate PA were lower. These differences may be caused by the variety in lifestyles of communities as well as participation of nonhospitalized patients in the study of Vancampfort et al. Considering the details of PA investigated through the long form of questionnaire, we found no significant difference in terms of activities related to work, transportation, and leisure-time activities between the two groups. Most participants in both groups were unemployed, which can surely reduce the level of PA. In a meta-analysis by Soundy et al., higher rates of inactivity as well as moderate and vigorous PA were reported in patients with schizophrenia than the general population. In this meta-analysis, the total minutes of PA were 2191.4 min/week, the total minutes of moderate PA were 137.5 min/week, and the total minutes of vigorous PA were 23.1 min/week. In comparison with the results of Soundy et al. 's study, our patients had less total minutes of PA as well as less total minutes of moderate and vigorous PA. In the meta-analysis of Soundy et al., a self- report questionnaire (SRQ) was used. Because the meta-analysis mentioned above had used the general “SQRs” keyword; studies using different self-report questionnaires were entered, so difference in the data collection method can be a reason for the difference between results of our study and this meta-analysis. On the other hand, this meta-analysis includes other types of patients such as schizophreniform or schizoaffective disorder. Negative symptoms in patients with schizophrenia such as self-neglect, lack of participation in activities, and functional disability often lead to sedentary lifestyle. In the case of hospitalization, the patient usually has more symptoms and a lower level of performance. Increase in the duration of hospitalization has a considerable effect on the decrease of PA level. Negative symptoms and cognitive impairments are among the main causes of inability to work and unemployment. Hence, unemployment is a common problem among these patients. The presence of depressive phases in patients with BD can make these patients sedentary, while the presence of manic phases can lead to an increase in their level of PA. Therefore, the PA in these individuals can be related to their course of the disease. Among the limitations of this research, the following cases can be mentioned: since nonhospitalized patients were not available, we just studied the hospitalized patients, so the results cannot be generalized to nonhospitalized patients. Another limitation was the lack of opportunity to utilize control group from healthy individuals. Due to the inability of patients to answer the questions, we hold interviews with their nurses or family members to complete the questionnaires. The reminder limitation on the part of these people may lead to an underestimation or overestimation of the findings. In most cases, the patient's nurse or family members did not remember the length of time that the patient was sitting; hence, we could not gather any information about the amount of time spent in sitting position. Another limitation regarding the data collection tools is the inappropriateness of the IPAQ for people under the age of 15 or over 69 years; thus, people who were within this range of age did not enter the study. The findings of this study indicate a high prevalence of low PA and an inappropriate level of PA in both patient groups. Comparing the two patient groups, the bipolar patients had a relatively better level of PA than those with schizophrenia. In this regard, sedentary behavior should be a concern across the life span of inpatients with schizophrenia and BD. Facilities and programs of regular exercise should be provided in the hospitalization and care centers of these patients so that they can improve their physical and mental health. More attention should be paid to people with schizophrenia, since they often have lower functional levels and less willingness to participate in individual and group activities. Further studies with a larger sample size and a control group from the general population are also recommended. Since patients may have different levels of PA at different stages of the disease spectrum, it is suggested that in future studies, the level of PA should be evaluated separately from the disease stage. The authors thank the staff of psychiatric hospital of Yazd, fatemeh Al-Zahra charity institiute in Yazd, and families of patients for their help with data collection. The funding of this study is provided by the School of Public Health, Shahid Sadoughi University of Medical Sciences. Jakobsen AS, Speyer H, Nørgaard HC, Karlsen M, Hjorthøj C, Krogh J, et al. Dietary patterns and physical activity in people with schizophrenia and increased waist circumference. Schizophr Res 2018. pii: S0920-9964(18)30168-3. Arjmand MR, Jadidi NF. Kaplan & Sadocks Pocket Handbood of Clinical Psychiatry. Jalili A, 2nd ed. Iran: Arjmand; 2010. Tandon R, Gaebel W, Barch DM, Bustillo J, Gur RE, Heckers S, et al. Definition and description of schizophrenia in the DSM-5. Schizophr Res 2013;150:3-10. Çankaya PK, Tİryakİ A, Arslan FC, Çankaya S. Comparison of the prevalence of metabolic syndrome in patients with schizophrenia and bipolar disorder: A cross-sectional study from Black Sea region. Diabetes Metab Syndrome 2017;11:411-6. Sriretnakumar V, Harripaul R, Vincent J, Kennedy J, So J. F195. Enrichment of pathogenic variants associated with treatable genetic diseases in large schizophrenia, bipolar and depression cohorts. Schizophrenia Bull 2018;44 Suppl 1:S296. Brown S, Kim M, Mitchell C, Inskip H. Twenty-five year mortality of a community cohort with schizophrenia. Br J Psychiatry 2010;196:116-21. Laursen TM. Life expectancy among persons with schizophrenia or bipolar affective disorder. Schizophr Res 2011;131:101-4. Ringen PA, Engh JA, Birkenaes AB, Dieset I, Andreassen OA. Increased mortality in schizophrenia due to cardiovascular disease – A non-systematic review of epidemiology, possible causes, and interventions. Front Psychiatry 2014;5:137. De Hert M, Correll CU, Bobes J, Cetkovich-Bakmas M, Cohen D, Asai I, et al. Physical illness in patients with severe mental disorders. I. Prevalence, impact of medications and disparities in health care. World Psychiatry 2011;10:52-77. DE Hert M, Schreurs V, Vancampfort D, Van Winkel R. Metabolic syndrome in people with schizophrenia: A review. World Psychiatry 2009;8:15-22. Bobes J, Arango C, Garcia-Garcia M, Rejas J. Healthy lifestyle habits and 10-year cardiovascular risk in schizophrenia spectrum disorders: An analysis of the impact of smoking tobacco in the CLAMORS schizophrenia cohort. Schizophr Res 2010;119:101-9. Strassnig M, Brar JS, Ganguli R. Nutritional assessment of patients with schizophrenia: A preliminary study. Schizophr Bull 2003;29:393-7. Vancampfort D, Probst M, Sweers K, Maurissen K, Knapen J, De Hert M, et al. Reliability, minimal detectable changes, practice effects and correlates of the 6-min walk test in patients with schizophrenia. Psychiatry Res 2011;187:62-7. Stubbs B, Williams J, Gaughran F, Craig T. How sedentary are people with psychosis? A systematic review and meta-analysis. Schizophr Res 2016;171:103-9. Fort D, et al. Physical activity and sedentary behaviour in outpatients with schizophrenia: A systematic review and meta-analysis. International J Therapy and Rehabilitation 2013;20:588-95. Barry VW, Baruth M, Beets MW, Durstine JL, Liu J, Blair SN, et al. Fitness vs. fatness on all-cause mortality: A meta-analysis. Prog Cardiovasc Dis 2014;56:382-90. Després JP. Physical activity, sedentary behaviours, and cardiovascular health: When will cardiorespiratory fitness become a vital sign? Can J Cardiol 2016;32:505-13.
WHO. Physical Activity; 2018. Available from: http://www.who.int/mediacentre/factsheets/fs385/en/. [Last accessed on 2018 Jun 4]. Bouchard C, Blair SN, Haskell W. Physical Activity and Health. 2nd ed. London: Human Kinetics; 2012. Committee Physical Activity Guidelines for Americans. Physical Activity Guidelines for Americans. Washington, DC: US Department of Health and Human Services; 2008. p. 15-34. US Department of Health and Human Services. 2008 Physical Activity Guidelines for Americans. Washington, DC: US Department of Health and Human Services; 2008. Bull F, Biddle S, Buchner D, Ferguson R, Foster C, Fox K. Physical activity guidelines in the UK: Review and recommendations. School of Sport, Exercise and Health Sciences, Loughborough University; 2010. Department of Health. Australia's Physical Activity and Sedentary Behaviour Guidelines. Canberra, Australia: Department of Health; 2014. World Health Organization. Global Recommendations on Physical Activity for Health. Geneva, Switzerland: World Health Organization; 2010.
llal PC, Andersen LB, Bull FC, Guthold R, Haskell W, Ekelund U, et al. Global physical activity levels: Surveillance progress, pitfalls, and prospects. The Lancet 2012;380:247-57. Ferreira L, Belo A, Abreu-Lima C; RICAVA Study Group. A case-control study of cardiovascular risk factors and cardiovascular risk among patients with schizophrenia in a country in the low cardiovascular risk region of Europe. Rev Port Cardiol 2010;29:1481-93. Craig CL, Marshall AL, Sjöström M, Bauman AE, Booth ML, Ainsworth BE, et al. International physical activity questionnaire: 12-country reliability and validity. Med Sci Sports Exerc 2003;35:1381-95. Moghaddam MB, Aghdam FB, Jafarabadi MA, Allahverdipour H, Nikookheslat SD, Safarpour S. The Iranian version of international physical activity questionnaire (IPAQ) in Iran: Content and construct validity, factor structure, internal consistency and stability. World Appl Sci 2012;18:1073-80. Faulkner G, Cohn T, Remington G. Validation of a physical activity assessment tool for individuals with schizophrenia. Schizophr Res 2006;82:225-31. Vancampfort D, Wyckaert S, Sienaert P, De Herdt A, De Hert M, Rosenbaum S, et al. Concurrent validity of the international physical activity questionnaire in outpatients with bipolar disorder: Comparison with the sensewear armband. Psychiatry Res 2016;237:122-6. Vancampfort D, Probst M, Scheewe T, De Herdt A, Sweers K, Knapen J, et al. Relationships between physical fitness, physical activity, smoking and metabolic and mental health parameters in people with schizophrenia. Psychiatry Res 2013;207:25-32.